2 sorters, delivered 6 months apart and which include two functions: one to create a stock upstream of the packaging zone and the other to sort the panels according to the timing of shipments. 1 regulator to optimize the flow between the sawing machine and the edgebanding machine. 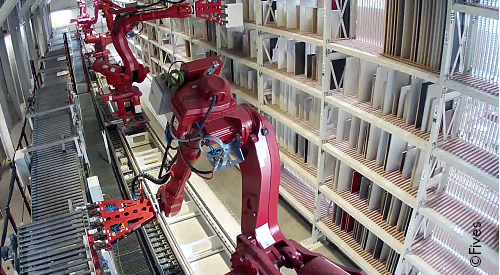 2 zones of robotized storage with a capacity of 480 pieces with 2 robots installed on two travel tracks. Thanks to technological advances in the two previous projects, realized in 2008 and 2013, Schmidt Group has chosen Fives again among several potential suppliers to complete this new project in their 3rd factory, granted us with the totality of handling, storage and sorting facilities. Only robotics can meet the kitchen furniture industry needs, characterized with “just ordered, just manufactured”, in terms of performance, reliability and especially flexibility. As regards to the short delay and the complexity of the algorithms that control the robots, the entire facility will be simulated (flow and operative part simulation) in order to meet these expectations. This Fives unique and patented design solution allows high sorting speed of parts with unrivaled performance on the market.